Nothing sparkles like crystal and your guests will agree you really "rose" to the occasion with these elegant choice Crystal Long Stem Roses. The ultimate symbol of love, fidelity and strength, the rose is a perennial favorite for engagements, bridal showers, weddings, and every special celebration. Good things come in small packages and this indulgent miniature measures a dainty 3 1/2" in length and features a luminous crystal bud atop a silver metal stem with embossed leaves. 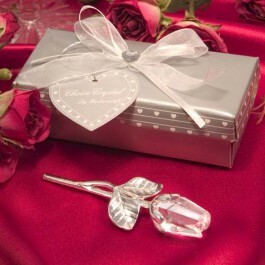 Surrounded by satin, inside a signature silver heart design box (4 1/4" x 1 7/8"), these favors are stunningly detailed. Finishing touches include an organza and satin bow topped with a crystal heart and an attached matching heart shaped tag. *Crystal is clear and colorless.